LOS ANGELES, CA and LAS VEGAS, NV--(Marketwire - January 6, 2011) - WOWee, the pioneer in portable, amplified acoustics, today announced the unveiling of the WOWee ONE Slim mobile audio solution at the Consumer Electronics Show 2011 (South Hall 3 Booth# 31812). The company behind the patented gel audio technology that produced this year's hot selling WOWee ONE Power Bass Speaker -- a palm-sized combination speaker subwoofer -- has again released some of the best technology in portable audio. Since its release in April 2010, nearly half a million WOWee ONE Classics have been shipped worldwide. Offering a game-changing solution to portable speaker needs, WOWee is introducing the WOWee ONE Slim, an even smaller, pocket-sized, rechargeable speaker in a size comparable to a standard smart phone. The WOWee ONE Slim yields room-filling, rich audio on par with the original WOWee ONE Power Bass Speaker in a sleeker and more portable design. "In all my time in music, I can honestly say I was amazed when I first heard a WOWee ONE in action," said Chris Tarrant, English radio broadcaster and television presenter. "It's an amazing way to listen to my music everywhere I go. Frankly, everyone should have one -- they're so much fun. I love mine." British Airways' High Life magazine has also named the WOWee ONE as one of its best selling personal electronic gadgets. The new WOWee ONE Slim will retail for $89.99, and the WOWee ONE Classic will remain at $79.99. The WOWee ONE speaker offers portability that yields tremendous freedom for mobile technology users. Everyone with a mobile device -- from an iPod, cell phone, PSP, or iPad, to a laptop or Macbook -- will want to have a new Slim. The WOWee ONE unleashes your music by allowing the listener to pump out tunes or other audio with projected, room-filling audio. A wall, window, desk, table, cooler, surfboard, cardboard box or even floors become audio projection surfaces when adorned with the WOWee ONE. Just like a musical instrument, the surface chosen affects the sound that is produced. Each different surface provides a unique musical tone, perfect for a wide range of genres and styles. In addition to it being a great portable speaker for any music-playing device, it's a wonderful tool for on-the-go executives with laptops as a speaker for presentations or for watching movies. 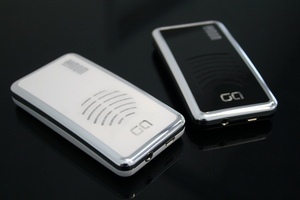 It significantly enhances the portable gaming experience by letting the user feel the sound effects of their games. The WOWee ONE is ideal for spontaneous parties with music that can fill a room in any venue imaginable. Offering audio projection for phone calls, as well, the WOWee ONE provides boosted audio for speakerphone use with any cell phone with a standard headphone jack. The WOWee ONE Slim and Classic come in several colors and styles -- The Original: Black on Black, Black & Chrome, and Pink & White. WOWee ONE recently released their White WOWee ONE Speaker, which will be a perfect companion to the highly anticipated white iPhone. The WOWee ONE uses a unique dual-speaker solution in a single unit that houses an internal, rechargeable battery to deliver thumping lows and clear highs. A top-firing speaker provides high-range fidelity for crisp sound reproduction. A down-firing speaker uses patented Gel Audio™ technology to project low-frequency sound waves that turn adjoining objects or surfaces into an on-the-fly subwoofer. For less than $100, the WOWee ONE delivers more dynamic sound right out of the pocket than products costing and weighing more than three times as much. The WOWee ONE Slim boasts a dynamic response range of 40Hz - 20KHz and reaches 90 decibels, yet weighs only 4 ounces. The Slim has a battery life of 10 hours and measures just 4.3" by 2.2" by .7", ideal for a pocket, handbag, backpack, or glove compartment, so it's always handy. The WOWee ONE Classic has a dynamic response range of 40Hz - 20KHz and reaches 90 decibels yet weighs 7 ounces. The Classic has a battery life of 20 hours and measures 4.7" by 2.4" by 1". Both WOWee ONE speakers connect to the 3.5mm audio/headphone jack of any mobile device and come with a standard 3.5mm audio cable. 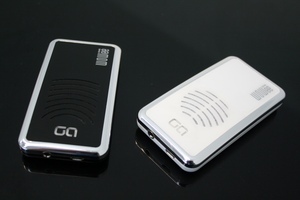 The units also come with cables for charging or powering the WOWee ONE when connected to a standard powered USB port. A self-adhering and easily removable bracket (the 'hug') that mounts the WOWee ONE to walls or windows is also available. Visit http://www.woweeone.com for more information.